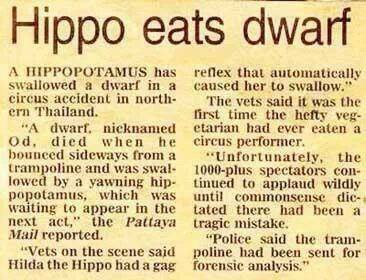 So I get this email today titled “Hippo Eats Dwarf!” and the attached “news clipping” so it has to be true, right? Wrong. Looks legit. However, it just feels like a hoax. They sent the trampoline off to be tested?? Better ask ma-Google. Well, not only is it a hoax, it’s the title of a book about hoaxes. Oh well. I’m glad the little guy never died. I’m also glad this wasn’t a YouTube video. But, as cruel as a death as it might have been, I secretly wanted it to be true. I’ve always said, when my time comes, I hope it’s part of an amazing story — like being swallowed whole by a hippo. How do you want to die? What do you think happens when you do? Let me know in the comments. UPDATE: I’ve added some important links at the end of this article. Although the warning’s author argues for the outright ban of hand sanitizer from any home where small children reside, it needs be kept in mind that a 2005 study of 292 families by Children’s Hospital Boston (in which one-half of the subjects got hand sanitizers, while the other half received literature advising them to wash their hands frequently) found that those who used hand sanitizer gels experienced a 59% reduction in gastrointestinal illnesses, and that increased use of sanitizers corresponded with a decreased spread of contagions (including those resulting in respiratory illnesses). Ok. I don’t know where to begin because the last 2 days of my life have been such a blur. Yesterday, My youngest daughter Halle who is 4, was rushed to the emergency room by her father for being severely lethargic and incoherent. He was called to her school by the school secretary for being “very VERY sick.” He told me that when he arrived that Halle was barely sitting in the chair. She couldn’t hold her own head up and when he looked into her eyes, she couldn’t focus them. He immediately called me after he scooped her up and rushed her to the ER. When we got there, they ran blood test after blood test and did x-rays, every test imaginable. Her white blood cell count was normal, nothing was out of the ordinary. The ER doctor told us that he had done everything that he could do so he was sending her to Saint Francis for further test. Right when we were leaving in the ambulance, her teacher had come to the ER and after questioning Halle’s classmates, we found out that she had licked hand sanitizer off her hand. Hand sanitizer, of all things. But it makes sense. These days they have all kinds of different scents and when you have a curious child, they are going to put all kinds of things in their mouths. When we arrived at Saint Francis, we told the ER doctor there to check her blood alcohol level, which, yes we did get weird looks from it but they did it. The results were her blood alcohol level was 85% and this was 6 hours after we first took her. There’s no telling what it would have been if we would have tested it at the first ER. Since then, her school and a few surrounding schools have taken this out of the classrooms of all the lower grade classes but what’s to stop middle and high schoolers too? After doing research off the internet, we have found out that it only takes 3 squirts of the stuff to be fatal in a toddler. For her blood alcohol level to be so high was to compare someone her size to drinking something 120 proof. So please PLEASE don’t disregard this because I don’t ever want anyone to go thru what my family and I have gone thru. Today was a little better but not much. Please send this to everyone you know that has children or are having children. It doesn’t matter what age. I just want people to know the dangers of this. Teach your child the 10 commandments in less than 5 minutes! The following is a hoax. And you can smell it. False or weak validation. In this case, Allison Malone her husband’s cousin’s friend. Corporate discrimination: Those evil mall people who we all know are hiding every crime that ever happens there. False authority: Signed by a lawyer’s office – yeah, so it must be real. Be careful while forwarding emails – that would be a better subject line. This has happened six times in the Mall at Barnes Crossing since the holiday season has started. Allison Malone’s (my husband’s cousin) friend was one of the mothers it happened to. She did get her baby back. The mall doesn’t want to tell people about it b/c they fear it will affect their profit for the holiday season. A couple of weeks ago a lady with two kids was shopping at JCPennys in the mall here at Tupelo. One of her sons was pretty small and he was in a stroller buckled in and the other one was older and he was walking beside her. A Mexican woman came by and told the lady how cute her little baby was…well the lady told her “Thank You” and went on her way. A couple of minutes later the Mexican woman approached the lady again telling her how cute her little baby boy was. The lady again replied with thank you. As the lady turned her back to look at a piece of clothing then the oldest son said “the lady took the baby”. The lady turned around to find that the Mexican lady had unbuckled the baby and grabbed him out of the stroller and took off with him. The lady ran after them and caught the Mexican woman as she was getting out the door with her son. The only way that she caught her was the Mexican woman had long hair and she pulled it and knocked her down. The lady held her in her custody until the authorities arrived. The lady was shocked when the authorities asked her if she wanted to press charges. The lady replied back with “of course, this is my son you’re talking about”. Come to find out the Mexican lady was here illegally. They are coming here to steal our kids and carry them across the border to sell on the Black Market. It’s not just Mexicans there are Caucasians and African Americans involved in this also. Subject: Fw: PLEASE DO THIS, IT IS HYSTERICAL! An old lady walked into a Grocery Store. She went up to the cash register to buy the food. eat the animal food themselves. back to the store to buy her dog food. Grocery Store to buy the cat food. again carrying a big container. your hand inside here “..
bite you,” the old lady said. must send it to at least 8 people. Please do not forward these type of things. They waste people’s time and bandwidth. This is quite possibly the most poorly written hoax/chain letter I’ve personally ever seen. Yet, it’s still popular. Shocking.